With his starting offense struggling through the first half of Saturday’s preseason game against the Baltimore Ravens, managing a lone field goal in five possessions, Washington Redskins Coach Jay Gruden brought quarterback Robert Griffin III back for more work. It only got worse, with Griffin throwing an interception to open the third quarter. Four plays later, Baltimore padded its lead with a 21-yard field goal. And Griffin’s night was done, with the franchise quarterback compiling nothing but grim statistics — three sacks, one interception and no touchdowns — that equated to a 27.1 passer rating. Baltimore rolled on for a 23-17 victory in front of an announced 70,876 at M&T Bank Stadium, the second-largest preseason crowd in Ravens history. The Redskins trailed 10-3 when the second-team offense took over. Working against Baltimore’s backups, Kirk Cousins engineered a 13-play drive capped by an 11-yard touchdown throw to Santana Moss that pared the deficit to 13-10. Late in the fourth quarter, Cousins marched the Redskins 81 yards for another touchdown drive, connecting with Nick Williams on the seven-yard strike. Cousins completed 14 of 20 throws for 122 yards and the two touchdowns, and Colt McCoy mopped up. Overall, Washington must go back to work, at least on the offensive side of the ball, in the two weeks that remain before the Sept. 7 season opener in Houston. With the Redskins’ starters getting their most extensive playing time yet, Saturday’s third preseason game was the equivalent of a dress rehearsal. The defense had several impressive stands. Lineman Jason Hatcher, the key defensive pickup in the offseason from the Dallas Cowboys, made his 6-foot-6, 299-pound presence felt in his debut. Working on the right end of the line, Hatcher flew in for a sack of Ravens quarterback Joe Flacco less than eight minutes into the proceedings, looking fully healed from knee surgery in June. 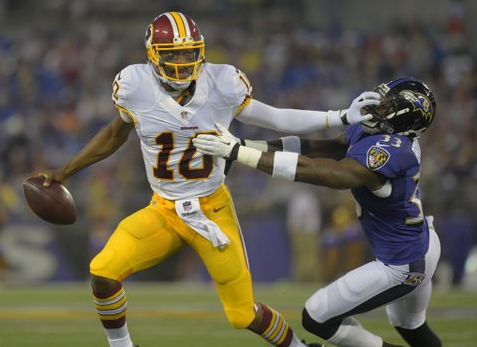 But the showing by Washington’s first-team offense was calamitous. Of the six drives Griffin engineered, two were three-and-outs. One ended on a sack; another on the interception. Griffin’s throw was meant for running back Alfred Morris, who was all but draped by defenders. With a tip, Baltimore’s C.J. Mosley grabbed it and ran it back to the Washington 9. Griffin finished 5 of 8 for 20 yards. His longest completion was seven yards. He lost 15 yards on the three sacks. More importantly, his decision-making about when to throw the ball away and when to scramble, something Gruden harped on throughout training camp, remains questionable. Saturday’s game didn’t only give Washington’s starters their longest competitive test; it gave them their most formidable. Baltimore has missed the playoffs just once in the past six seasons. And the Ravens’ vaunted defense was more than the Redskins’ starters could handle, even with their top three cornerbacks sidelined for the game. The Redskins’ defense gave up a 23-yard passing play to start, with Brian Orakpo missing a tackle. But Washington clamped down when it mattered. Linebacker Keenan Robinson made a terrific open field tackle on a fourth and 1. Taking over at midfield, Washington surged 19 yards on a carry by Morris. Griffin’s first throw, to DeSean Jackson, was intercepted but negated by a Baltimore penalty that advanced the Redskins to Baltimore’s 10. And yet again, the first-team offense screeched to a halt in the red zone. Morris gained a single yard on two carries. And Griffin, fielding a high snap, couldn’t find an open receiver and took off running to his right. His stiff-arm did little to hold off the rush, and he didn’t so much slide as crumple on the sideline, sacked for a 6-yard loss. Kai Forbath salvaged the possession with a 32-yard field goal to put Washington ahead, 3-3. 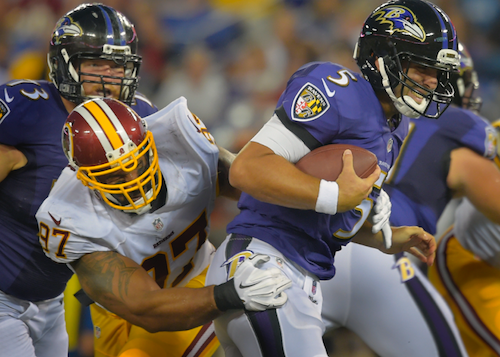 Hatcher replied in kind, sacking Baltimore quarterback Joe Flacco, who ended up under a pile of swarming defenders. Washington’s second offensive possession was a three-and-out that ended with Griffin lunging on his own fumbled snap. He recovered, but Washington was forced to punt. Terrific play by cornerback David Amerson and defensive end Jarvis Jenkins held Baltimore scoreless on its next series. Amerson broke up a would-be touchdown throw in the corner of the end zone, and Jenkins had the tackle on another fourth-and-1 attempt. Again, Washington’s first-team offense couldn’t get anything going. Another Griffin scramble on third down fell short. Baltimore’s Justin Tucker kicked a 36-yard field goal in the second quarter, the drive aided by a 15-yard penalty against safety Brandon Merriweather for a helmet-to-helmet hit. Griffin took a shot at Jackson to open the fourth series, but the roughly 50-yard throw fell incomplete. Griffin was later sacked a second time, for a loss of five, and the only encouraging play — a reception that tackle-busting tight end Jordan Reed stretched for a first down — was negated by a holding call on Trent Williams. Washington’s fifth series was like Groundhog Day: another three-and-out that ended with Griffin scanning the field for an open receiver as Baltimore’s pass rushers enveloped him in a heap. It was his third sack of the game. Flacco, by contrast, had found his passing rhythm and moved the Ravens crisply down field, capping an eight-play drive with a 24-yard touchdown throw to 14-year NFL veteran Steve Smith, as Redskins cornerback E.J. Biggers stumbled in pursuit.